One of the negative economic surprises this morning was the existing home sales number which dropped 1.5% in May. Not a real surprise, right? Slowing economy is resulting is slower sales. But it turns out there is something else afoot here. According to NAR, sales have slowed because of housing supply shortages. NAR: - Limited supplies of housing inventory held back existing-home sales in May, but sales maintained a strong lead over year-ago levels and home prices are on a sustained uptrend in all regions, according to the National Association of Realtors. Total existing-home sales1, which are completed transactions that include single-family homes, townhomes, condominiums and co-ops, declined 1.5 percent to a seasonally adjusted annual rate of 4.55 million in May from 4.62 million in April, but are 9.6 percent above the 4.15 million-unit pace in May 2011. Lawrence Yun, NAR chief economist, said inventory shortages in certain areas have been building all year. "The slight pullback in monthly home sales is more likely due to supply constraints rather than softening demand. The normal seasonal upturn in inventory did not occur this spring," he said. "Even with the monthly decline, home sales have moved markedly higher with 11 consecutive months of gains over the same month a year earlier." There are broad-based shortages of inventory in the lower price ranges in much of the country except the Northeast, and in the West supply is extremely tight in all price ranges except for the upper end. Is that possible? What happened to the "shadow" housing inventory ("millions" of homes)? NAR: - "Realtors in Western states have been calling for an expedited process to get additional foreclosed properties onto the market because they have more buyers than available property," Yun added. Widespread inventory shortages also are found in much of Florida. Is the shadow demand finally catching up with the supply? House prices for actual transactions are indeed showing signs of improvement. FHFA House Price Index was up again, an increase of 0.8% for May. 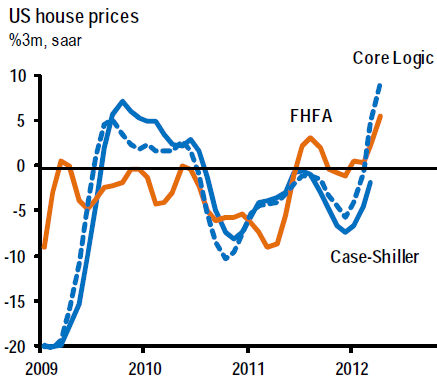 JPMorgan: - The FHFA house price index rose 0.8% samr in April and is up a cumulative 3.1% over the past six months. The more widely followed Case-Shiller house price index is out next Tuesday. House prices are firming after an extended post-homebuyer tax credit downleg. We are still getting hate mail for this post on US housing from the beginning of the year. But the data above is becoming more difficult to argue with.